We’re not going to tell you to give out pennies and peppermints — that would be more terrifying than a haunted house! We’re sharing healthier treats to pass out than the usual Halloween fare. 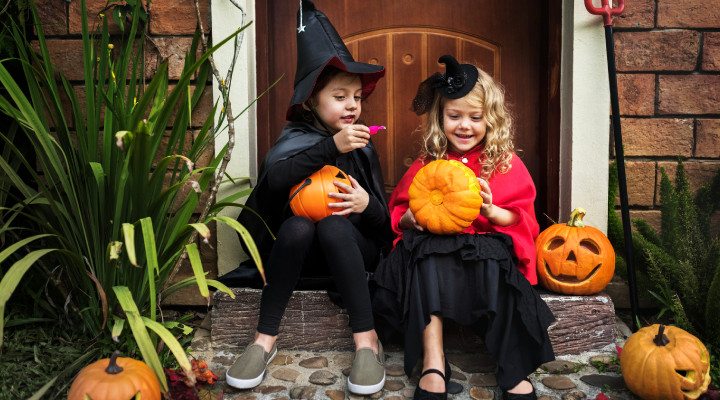 This year, try these healthy Halloween treats for trick-or-treaters. Stay tooth-friendly while still being kid-pleasing! You might even be the most popular stop in the neighborhood! Milk or Dark Chocolate: Chocolate is one of the best options to give to trick-or-treaters. Chocolate melts quickly after a bite. That means is washes off teeth easily, making it harder for bacteria to cling to enamel. Sugar Straws: We know powdery candy is mostly made of pure sugar (hence the name, “SUGAR straws”). But, like chocolate, powdery candy dissolves quickly and doesn’t stick to teeth. Sugar-Free Gum: Kids love long-lasting, bubble-making candy. We encourage sugar-free gum because it generates saliva that removes food particles from the mouth. Look for a sugar-free gum that contains xylitol, a sweetener that reduces mouth bacteria. Temporary Tattoos & Stickers: Stickers are inexpensive and universally loved. Feel free to add temporary tattoos to the mix — they’re like stickers that last longer! Bonus: You get to see little ones delight as they choose their favorite spooky sticker or temporary tattoo. Glowsticks: These unique treasures will bring bright lights to the Halloween night. Just make sure your trick-or-treater isn’t too young for one. Dress-Up Accessories: Help inspire a kiddos costume for next year! Small items like vampire teeth, an eye patch, costume jewelry, or sunglasses make fun additions to your October 31st offerings. In preparation for Halloween, we suggest buying one to two items from each category. When your trick-or-treaters arrive, let them pick one treat and one treasure. Once the night ends, you deserve a pat on the back for providing healthy Halloween treats for trick-or-treaters.